Dayton, August 17 2018 - Dayton Dutch Lions FC is still enjoying their Championship season but Coaches Dan Griest and Kevin Terrell are already working on their 2019 roster. Meanwhile the youth academy season is starting up again for the Fall season. Former DDL FC goalkeeper Stefan Cleveland made his debut earlier this month in MLS for Chicago Fire. Houston Dutch Lions FC started the registration process for the youth academy for the 2018-2019 season. After another successful year the club is expecting to have over 400 players. Cincinnati Dutch Lions FC recently launched their youtube channel: https://www.youtube.com/c/CincinnatiDutchLionsFC. The coaching staff also started their scouting process for the 2019 season scheduling visits to various college games in the area. CDL also made a nice overview of the nine players that turned professional sofar after playing for CDL FC in recent years: https://cdlfc.com/2018/08/cdlfc-path2pro/. 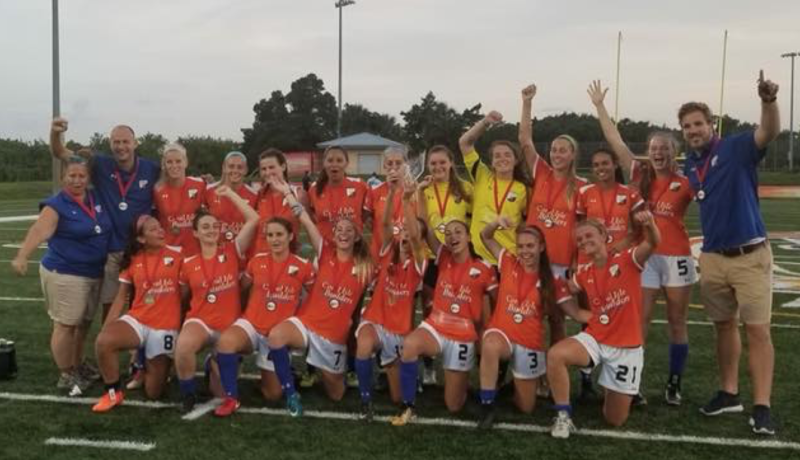 With the success in 2018 several more are expected to turn pro after their senior year.Florida Gulf Coast Dutch Lions FC won several WPSL awards after their successful 2018 season winning the Conference Championship. The club finished second in “Best Franchise of the Year”. Goalkeeper Casey Winn was awarded “Best Defensve Player of the Year”, Sylvana Gordon was awarded “Best Offensive Player of the Year”, while Head Coach Vincent de Weger finished 3rd in “Best Coach of the Year”. After a few weeks off the Youth Academy already started back up again this week preparing for the 2019-2020 season. The whole academy is traveling “in orange” to Tampa on the 25th to support FC Cincinnati in their USL PRO game vs Tampa Bay Rowdies. New York Dutch Lions FC had no activities recently but is already working towards securing their 2019 games. FC Cincinnati (14-3-6) picked up another win at home at Nippert Stadium in front of 24,249 fans beating Penn FC 1-0. The team remains in first place and have been unbeaten for 12 games. They now play n3 Charleston Battery (11-3-10) at home on Saturday at 7.30pm.